2Apr2013 posted by: liltiger | share this: category: Events: Past, Houston, Impulse Travels, JD, Lil Tiger, Music, NYC, Updates no comments yet. 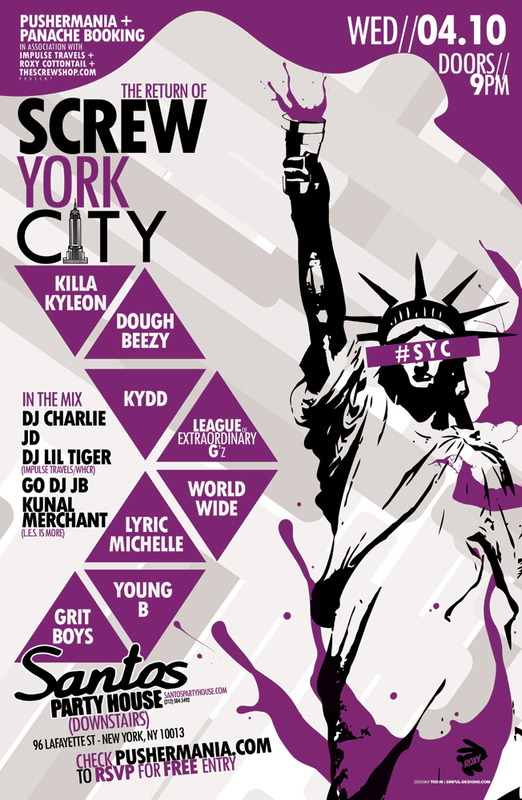 Long-time homie Pushermania is bringing Texas rap back to NYC in a big way, and buhbOmp‘s JD and DJ LIL TIGER will be joining a DEEP lineup of Texas (and/or Texas-raised) DJs and MCs on stage at Santos Party House for THE RETURN OF SCREW YORK CITY. It’s gonna be a ton of talent repping various generations of Texas Rap, and it’s FREE with RSVP. Peep the full lineup and RSVP link below. impulse travels. ep329. 27 february 2019.
impulse travels. ep328. 20 february 2019.
impulse travels. ep327. 13 february 2019.
impulse travels. ep326. 06 february 2019.
impulse travels. ep325. 30 january 2019.
impulse travels. ep324. 23 january 2019.
impulse travels. ep323. 16 january 2019.
impulse travels. ep322. 09 january 2019.
impulse travels. ep321. 02 january 2019.
impulse travels. ep320. 26 december 2018. DJ LIL TIGER starts things off with a love-themed Soul set with splashes of classic disco and contemporary R&B. EMPANADAMN holds it down in the second half with a mesh of synthy dance, pop, Hip-Hop and electro. EPISODE 221. 02 AUG 2016.